Netflix released a cryptic teaser for a new project dubbed Homecoming, which many believe is a new documentary about Beyonce's iconic 2018 Coachella performance. 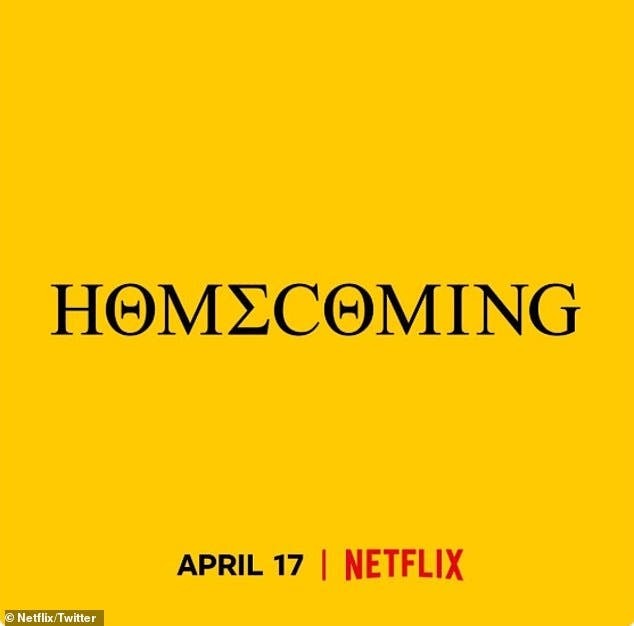 The teaser from Netflix Twitter uses the same yellow as Beyonce's sweater from the performance, while using Greek letters and the same font from the merchandise sold during her performance. While no further details about the project were released, except for the April 17 premiere date (which falls right in the midst of this year's Coachella), there was a report last week that indicated Netflix was working on a Beyonce documentary. The documentary will also include additional footage, but that report did not indicate it would be titled Homecoming. There is no indication if a trailer will be released between now and the April 17 release date, confirming Homecoming is in fact a Beyonce documentary. The US Weekly report also revealed that Bey is working on new music, though it won't be a full album. These tracks will be the first new songs she's released since her surprise 2016 album Lemonade, but she also released a joint album with husband Jay-Z, Everything Is Love, in 2018, ahead of their co-headlining tour. The release of Lemonade in 2016 made Beyonce the only female solo artist in history to debut at the #1 spot with her first six studio albums. She has sold over 100 million albums worldwide as a solo artist, plus another 60 million records as a member of Destiny's Child, making her one of the best selling music artists of all time. The Recording Industry Association of America (RIAA) certified Beyonce as the best-selling artist of the 2000s, along with her 23 Grammy Awards. Beyonce also recently announced a collaboration with Adidas for a new line of signatures sneakers and clothing dubbed Ivy Park. 'I look forward to re-launching and expanding Ivy Park on a truly global scale with a proven, dynamic leader,' she concluded.